This post discusses plot points from the first two episodes of Showtime’s Twin Peaks revival. 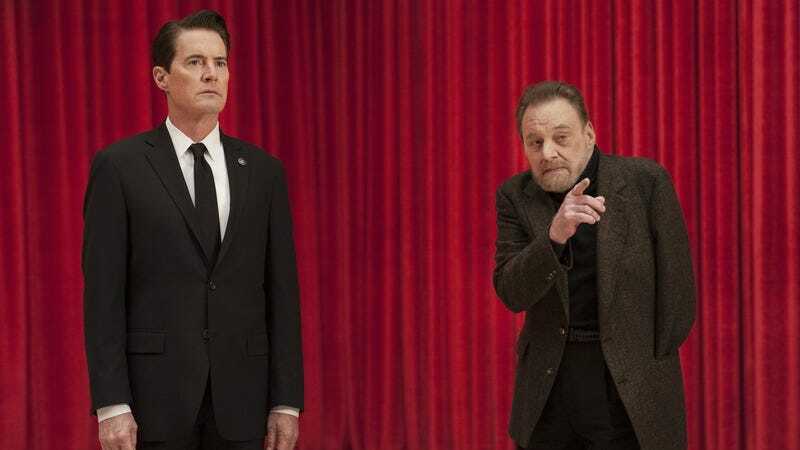 “Is it future, or is it past?” Mike (Al Strobel) asks FBI Special Agent Dale Cooper (Kyle MacLachlan) in the second half of Showtime’s two-hour Twin Peaks premiere. I feel like a lot of people might’ve woken up this morning asking themselves the same question. As much as the first two episodes do to set up new narrative threads involving about a high-school principal accused of murder, a mysterious glass box, and a leather-clad ruffian with a familiar face, there’s some intentional déjà vu as well. Coop and Laura Palmer (Sheryl Lee—at least she says she’s Laura Plamer) re-enact their Red Room meeting from the original series’ second episode; familiar bits of dialogue (“the new girl,” “it’s the line with the light that’s blinking”) float by on the breeze. The roadhouse still caters to bikers and townies who love gauzy dream-pop played by vampires who base all of their wardrobe decisions on Brando in The Wild One. Much has been made of the premiere’s jarring digressions from ABC’s Twin Peaks, but there are enough elements from the first two seasons around to serve as reminders that this is not only the continuation of the original story, but also the perpetuation of a cycle that’s been repeating for as long as there’s needed to be Bookhouse Boys. And more so than Doppel-Cooper’s reign of terror or the many bloodied corpses that pile up in the first two hours, it was the ravages of that monster, time, that socked me in the gut: Episode dedications to Catherine Coulson and Frank Silva, and references to characters—Major Garland Briggs, Phillip Jeffries—whose performers have since passed. Coulson’s encore as Margaret “Log Lady” Lanterman is particularly affecting: One of the most recognizable symbols of Twin Peaks’ zany side, The Log Lady also displays the show’s compassionate fascination with humanity. To the viewer, she initially appears as a local kook, but the series treats her with a seriousness befitting Coulson’s straight-faced delivery. Prior to her death in 2015, she returned the favor, conveying messages from Margaret’s log once more, in spite of her weakened state and nasal cannula. Amid the chaos, there is this note of poignance, Coulson’s palpable commitment to Twin Peaks worth more than all the fannish devotion that’s currently channeling into efforts to decipher the sets of numbers (430 and 253, for those keeping score at home) presented to Coop last night. In keeping with that theme, I couldn’t help but keep track of all the ways that modern technology is seeping into a world defined by its analog tape recorders and body-worn hearing aids. Doppel-Cooper uses his counterpart’s documentation habit to nefarious ends, but also knows his way around a conspicuously branded laptop; a living-room swallowing flat-screen has taken up a place of prominence at the otherwise unaltered Palmer residence. Most curious of all is the tangle of cables, lights, and pipes connected to the glass box in New York. It’s Lynchian industrial mixed-media sculpture for the digital era, all the menace of Eraserhead’s or Dune’s mechanical wastelands (or the sawmill equipment from the original opening) compressed into components that can fit inside a single room. Fortunately for us, the magic and mystery of Twin Peaks has not undergone a similar reduction in scale. Catherine Coulson’s performance as the Log Lady also stuck out for me as the most poignant reminder of how much time has passed since we last left Twin Peaks. I found it to be a touching farewell, a chance for Coulson to bring closure to her most famous role and thus secure her legacy. Another sign of the changing times that I hadn’t thought of was the introduction of HD to the Twin Peaks universe; I originally watched the series on VHS, and was surprised by how, well, different it was to see Dr. Jacoby’s face without familiar analog fuzz and old-school 4:3 aspect ratio at the beginning of episode one. I got used to it, though, especially after we left the town of Twin Peaks itself behind for Buckhorn, South Dakota, another small mountain town populated by Lynchian weirdos. I actually preferred the second episode over the first, particularly when it came to the introduction of Matthew Lillard as high-school principal/murder suspect Bill Hastings. In the first episode, Lillard’s dudebro slacker persona seemed to overwhelm his character as an ultra-square (it was the slack jaw, I think), but his jailhouse confrontation with his wife and subsequent breakdown in the second made me see what Lynch saw in him as an actor. But what really clinched it for me: the Black Lodge sequences in the second episode, which put the surrealism and horror that will clearly be foregrounded this season into the sharpest relief. The creature that emerges from the glass box in episode one harkens all the way back to Lynch’s first directorial effort, the animated short “Six Figures Getting Sick (Six Times),” and the “evolution of the arm” reminded me of Eraserhead’s mystery baby, giving us the sweet shot of “pure heroin Lynch” Mark Frost promised us before the premiere as well as a callback to Fire Walk With Me: “I am the arm and I sound like this.” That’s what I always liked about Twin Peaks, the juxtaposition of nightmare imagery and self-conscious absurdity, and this new season appears to be giving us heightened versions of both of those. Deputy Andy’s hair is goofier, the reveal of the decapitated dead body is more gruesome, and the network wasn’t allowed to give notes on either of them. Good. I should say here that I’ve only seen these first two episodes, though some of our colleagues and readers have already seen episodes three and four. But I will say that one of Lynch’s great talents is to take the familiar and banal and make it seem as though it were all moving through a single subconscious. His best film and TV work is authentically dream-like because he understands that dreams are not metaphors and yet still have meaning. They are pointing to something and it is in our nature to try and understand. They talk backwards, in a sense. This idea of the dream as a star witness, knocking on the door of the conscious mind in the middle of the night, is linked to Dale Cooper early in the series’ original series. And Cooper—with his boy scout values, his love of coffee, and his enthusiastic interest in dreams and meditation—is an alter ego for Lynch. I am not trying to offer a solution here. To think of a Lynch work as a puzzle to be solved is to miss the point. But with all of these aging familiar faces and the dichotomy between the freely roaming evil Cooper and the powerless good Cooper, doesn’t it seem like the space of this continuation of the series is that of Cooper’s subconscious? Everything has been pushed to extremes. The second episode features a white horse, which may be just another trick of Lynchian suggestion. But horses are also important in Carl Jung’s theories of the collective unconscious, and a dream involving a white horse figures in Sigmund Freud’s writings on the Oedipus complex. And in that mass unconscious that is American popular culture, horses suggest freedom, but also the death and disappearance of the past—the old West. There is an air of mortality, but not finality. What we’ve seen so far is as true a work of art for TV as anything. But am I the only one who, after finishing the first two episodes, found himself alternately grateful to Lynch and Mark Frost and kind of worried about Lynch’s health? Ignatiy, I was actually thinking of a similar language-related issue inspired by these episodes. It’s what the antidescriptivist Saul Kripke called the “primal baptism” of naming. For him, a name is a rigid designator, making something the same in all possible worlds. The naming that happens in Lynch’s work is foundational in a sense—an arm, a log—but, as the new episodes reveal, these things can evolve. There’s power in naming something, and Lynch’s work is obsessed with the idea that this power might work in unexpected ways. I’ll need to see more episodes to form a clearer opinion, but the power of naming appeared foundational at times, and in a way more akin to Inland Empire than the network iteration of the series. Like Katie, I was very weirded out at first by the digital HD look that gave certain scenes the feel of a late-night Cinemax production, though after awhile it became strangely fitting, especially as the series jetted all around the country. (Seeing beloved oddball Patrick Fischler pop up in the Las Vegas scene, to again warn someone to hope they never interact with a certain menacing presence—à la his Mulholland Drive monologue about the man behind the diner—was especially satisfying.) Lynch really does seem to be doing a kind of greatest hits of all his various passions and aesthetic styles from throughout his career, and using the universe of Twin Peaks to anchor them all in one story—which, as a diehard fan, was indeed pure Lynchian heroin. But what struck me most of all in these first two episodes was just how against the contemporary grain Lynch remains in his pacing. While much contemporary film and television sees increasingly rapid-fire editing, the dialogue tempo between these characters was almost defiantly glacial, notwithstanding a few more evenly measured moments (the jailhouse exchange between William and Phyllis Hastings mentioned above, for one). These are conversations here whose speed makes a Yorgos Lanthimos script sound like Aaron Sorkin. This determinedly patient back-and-forth was always an element of Twin Peaks: Think back to that season-two premiere, where Hank Worden’s doddering hotel waiter endlessly dithers while Dale Cooper lies bleeding out at the foot of his bed. But whereas in the show it was often played for laughs, here it was pure destabilizing mood, emphasizing the way the dreamlike nature of the events unfolding in Lynch and Frost’s sprawling narrative could shift into nightmare at any moment—and well before Lillard’s desperate principal insisted it all had to be. In that way, the languorous rhythm is as much a signpost for viewers, a way of easing us into an almost slow-motion reality through which to absorb these two hours, as it is diegetic reality for these troubled souls. And during the lengthy stretches of meaningful looks and pauses so pregnant they’re practically ready give birth then and there, it seemed as though Lynch was having a blast. For all his talk about being done making movies, the playground of Twin Peaks comes across like it genuinely delights him, in that it gives him license to roam throughout his subconscious without harness. It’s all the sprawl and play of Inland Empire, tethered to a recognizable world and story that grounds it. This feels like a winning combination, is my general bullet point here, and even the deeply elliptical opening hour had me riveted.